In late 1992, I received a call from a head hunter who was seeking suggestions for a senior scientist with a non-profit organization that had an odd acronym and long name: CIESIN, the Consortium for International Earth Science Information Network, based in Saginaw, Michigan. Although not senior myself, I thought I had a lot of the desired interdisciplinary expertise and experience already—in part from working with geographer Bob Kates as an assistant professor with the Alan Shawn Feinstein World Hunger Program at Brown University—so I applied for the position. After a short period working as a consultant, I began at CIESIN fulltime in March 1993, the same month that Dr. Roberta Balstad Miller took over as CIESIN’s second president. The Science Division I joined was directed by the late Jack Eddy, a noted space scientist with whom I had worked on a National Research Council study for the International-Geosphere Biosphere Program. In the first few years, we had the opportunity to launch some exciting new activities, including a Global Demography Project proposed by distinguished geographer Waldo Tobler and some innovative online data resources such as the Environmental Treaties and Resource Indicators (ENTRI) database and the China Dimensions data collection. With the Internet and the World Wide Web still in their early stages, CIESIN was ahead of the curve in bringing new data and information technologies to bear on interdisciplinary problems involving both the natural and social sciences. 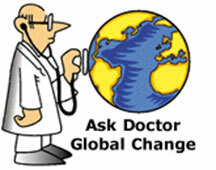 Ask Doctor Global Change was a reference service that helped users find data and information concerning changes to the global environment. for the U.S. Great Lakes, a set of online thematic guides on the human dimensions of global environmental change, the Ask Doctor Global Change service, the Archive of Census-Related Products, and the first of what would become several versions of the Gridded Population of the World data set. CIESIN also provided data integration services to the U.S. government’s State Failure Task Force and worked extensively with the Intergovernmental Panel on Climate Change (IPCC) Special Report on Emission Scenarios. With support from NASA, CIESIN designed and implemented a Socioeconomic Data and Applications Center (SEDAC) focused on the integration of remote sensing and socioeconomic data for interdisciplinary research as well as applications and decision making. I initially served as SEDAC’s Project Scientist and in 1995 took over as SEDAC manager. CIESIN’s location in Saginaw—far from Washington, DC and a healthy commute from key members of its consortium such as Michigan State University and the University of Michigan—was a key factor in the decision to seek a new home in late 1997. After an open call for a new host institution garnered more than four serious offers, CIESIN reinvented itself as the Center for International Earth Science Information Network within Columbia University’s newly established Earth Institute. 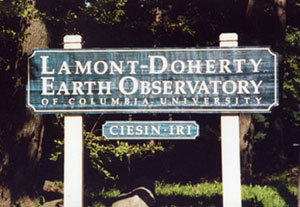 In July 1998 we settled into the Geoscience building on the Lamont campus in Palisades, New York. The year 2013 therefore marks CIESIN’s 15th anniversary at Columbia as well as my own 20th year with CIESIN, and next year will be the 25th anniversary of the original establishment of CIESIN in Michigan in November 1989. Over the past two decades, CIESIN has brought together a diverse array of talented individuals, interested in creative uses of data and information technology, tackling interdisciplinary research and practical problems, and addressing both short- and long-term challenges from local to global scales. Becoming part of the Earth Institute and a global university has enabled CIESIN to expand into new interdisciplinary arenas, enhance its scientific and policy impact, and take on stronger roles in teaching, data and information stewardship, and a range of partnerships and networks. 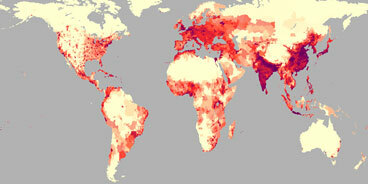 The first version of the Gridded Population of the World (GPW) data set, depicting the spatial distribution of human population across the globe. GPW version 3 was released in 2005, and version 4 is under development. When I started at CIESIN in 1993, I had no idea that I’d eventually become its director. But as it turns out, CIESIN provided on-the-job training not only with respect to advances in interdisciplinary science and information technology, but also in how to establish effective teams and collaborations, manage multiple projects and activities, evolve and rebuild an institution—and even how to deal with disasters like the Haiti earthquake and Superstorm Sandy. In an age of ongoing global change, marked by extreme events both near and far, rapid changes in how people communicate and use data and information, and uncertain financial and institutional pressures, it is essential for an organization like CIESIN to remain innovative and versatile and to explore new approaches and technologies in its work. I am confident that CIESIN’s long record of accomplishment, its resourceful and dedicated staff, and the growing need for its unique capabilities and experience will hold it in good stead in years to come.